Hello DiRT fans! We hope you’re all excited for next month – after all, with it being the last day of January, tomorrow puts us firmly in DiRT Rally 2.0 territory! These last couple of weeks have been incredibly busy for us as we’ve taken DiRT Rally 2.0 on tour; we started off at the Autosport Show, then went onto Germany, Spain, Italy, and Wales (not in that order – we honestly can’t remember which flights were when…) It’s been incredible seeing press finally get their hands on an (almost) finished game, and the reception has been brilliant. 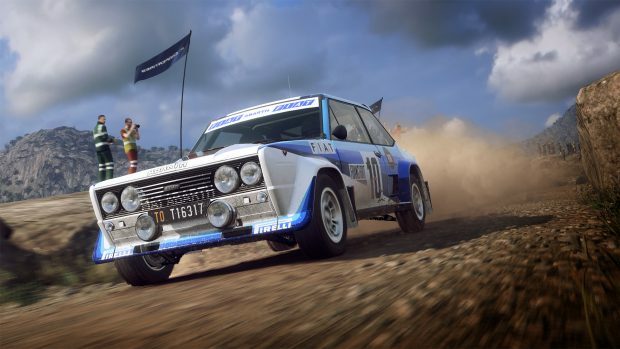 Here it is – the full and finalised car list for DiRT Rally 2.0! Of course, the only car not shown above is the Porsche 911 RGT Rally spec – which will only be initially available for those purchasing the Deluxe Edition or the Day One Edition. 60 days after the game launches, this will become available as separate DLC for those of you who want to pick up the Porsche – at which point, there will also be a whole host of seasonal content for you to enjoy too. We’ll also be back here soon with a full supported peripherals list so you have a full picture of what will be compatible with DiRT Rally 2.0 as well as lots more. But today, for now, we’ll leave you with this amazing video of Jon Armstrong taking Chief Games Designer Ross for a real life rally around Wales. We love the variety of emotions on display the most!